Finding new ways to engage conference participants is a challenge for many conference organizers. Entertainment, the Internet and media have transformed society into the participatory culture. Today’s conference audiences are accustomed to quick action, rapid scene changes, racing soundtracks and the ability to change their direction with a click. They expect visceral stimulation and are unwilling to sit passively for long periods of time. Enter Pecha Kucha and Ignite. Charlotte Pecha Kucha Night 2010. Image by Willamor Media. Pecha Kucha, Japanese for chatter, started in 2003 in Tokyo by two architects as a new way to deliver PowerPoint presentations. The design is simple: 20 slides, each shown for 20 seconds for a total of 6 minutes and 40 seconds. Slides advance automatically as the speaker presents. The objective is to keep the presentations brief to give more people a chance to present. In an hour’s time, audiences’ can hear about nine presentations. Ignite started in December 2006 in Seattle by O’Reilly’s Brady Forrest and Esty’s Bre Pettis. They wanted a way for people to share ideas and network in an informal setting. Ignite has two parts: contests where people make things and Ignite talks. Inspired by Pecha Kucha, Ignite talks follow a similar design: 20 slides, advanced automatically every 15 seconds for a total of five minutes. In an hour’s time, audiences can hear about 12 presentations. 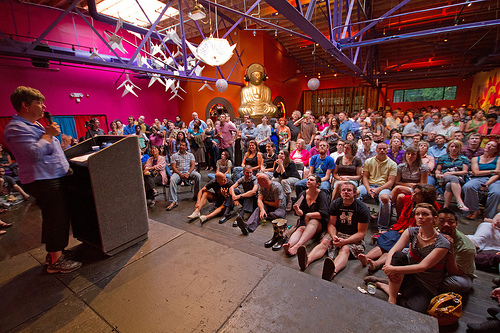 What’s The Goal Of Incorporating Pecha Kucha Or Ignite Into Your Conference? If you are considering adding Pecha Kucha or Ignite models to your conference, what is your goal? To provide a new form of information sharing? To promote participation of more speakers? To increase learning and retention? To entertain and keep the attention of your audience with a new presentation model? Both Pecha Kucha and Ignite are great models of using short concise presentations to provide information. They are great for entertainment too. Unfortunately, they are not great models to promote learning and retention. If you provide consecutive speakers every five to seven minutes, you’ve done nothing but created a series of unconnected information dumps for your audience. Yes, Pecha Kucha and Ignite models can keep an audience’s attention with their rapid fire presentations and flood of PPT slides. Yes, they follow the brain-friendly rule of chunking information into 10 minute segments. But here’s where they fall short. Working (short-term) memory can hold three to five pieces of information at any given time. Information in working memory has duration of about 20 seconds. If the information is not rehearsed or repeated, given more attention, connected to previous knowledge or discussed, it decays or is replaced. In order for the information to be encoded into long term memory, it must be integrated with previous knowledge and experiences in our long term memory. That takes time and intentionality. Providing a series of speakers without giving participants any time for reflection or discussion overwhelms the cognitive thinking process. It creates a cognitive overload and the brain does not remember much. Learning occurs when the learner abstracts meaning and connects the information in the working memory with existing knowledge in long-term memory. This means the learner must be given time to reflect and make meaning of the new information. The learner needs time to process the new information and connect it to past knowledge in long term memory. To use Pecha Kucha or Ignite models effectively, build five to 15 minute discussion periods after each presentation. Allow attendees to talk with each other about the information, not just ask the presenter questions. Consider an emcee that can facilitate audience discussion by asking relevant questions after each presentation. That will help attendees transfer new information from working to long-term memory. What do you like about Pecha Kucha or Ignite? How can you integrate these models effectively into your conference schedule? Excellent ideas for integrating big concepts into usable pieces for engagement and retention – thank you for that. It would be great if we could really see more of what we know about learning continuing to be translated into conferences – both the ones we organize as well as the ones we attend! Thank you for reading and responding. Some of the current conference education models just need slight tweaks to increase retention and memory! I’m beginning to see some conference organziers give attention to applying brain-friendly concepts in their education session. Let’s hope more start doing it too! So, I wonder where are the opportunities for digesting information, sitting with it, having a conversation,…? Sometimes I think we want to do too many things too fast, and wonder why things are breaking down and we are shutting down. I like the idea that panels could incorporate Pecha Kucha or IGNITE-style content introduction and then allow conversation and Q&A to fill the remaining time. A faster way of setting to the point. I’ve also used the formats at the end of a two-day conference to capture the learning. Small groups each created their own presentation with their key takeaways, and these were shared with the entire group. Those slide decks also become nice ways to go back and “tell the story” of the conferences with those who weren’t in attendance and demonstrating some of the conference’s values to the people who approve your budget to participate. I suppose if one was tweaked slightly it cold be a good marketing tool for the next year’s event. Interaction and participation are keys to successful presentations today. I agree some presenters have talked down or at their audiences. Successful presenters talk with their participants. Thanks for adding your views. Thanks for reading and sharing links to more information about Pecha Kucha and Ignite formats! Great idea about using the Pecha Kucha or Ignite models for a panel. I like that. And thanks for sharing how you have captured learning and key takeaways at the end of a conference. I like that format you described. I rank Ignite/Pecha Kucha high for entertainment and participation, but I would not bank on it for education. There is the entertainment that comes from watching your colleagues try to survive the challenge of the auto-advancing format. (If the presenter stumbles will they be steamrolled by their own PowerPoint presentation?) But when the presenter can’t keep up with the 15 (or 20) second per slide structure then the information is marred. The best Ignite presentations I’ve seen conveyed the presenter’s passion and enthusiasm for the subject more so than learnable information. I could see Ignite/Pecha Kucha being used in a somewhat “unconventional” setting, allowing a broad spectrum of people to share their interests with their peers and then make connections afterward when further discussion (and real learning) can take place. Thanks for reading and commeniting. I’m with you that most Ignite/Pecha Kucha presentations serve as information and entertainment. If the presenter follows a good presentation style like Kare addresses below and the audience is given time to digest it, learning can occur. Thanks for providing a great example of how people can provide a good content development for their Ignite/Pecha Kucha presentation.